Artists were among the first to see the value in the large affordable spaces in Barrio Logan, and now there are a few galleries and artist work spaces throughout the neighborhood. Red Fades Before Blue depicts the alleyway behind one of the first artists’ spaces in this neighborhood, the Bread and Salt building. The building was originally a bakery, producing bread, cakes, and donuts. A San Diego architect who left the huge industrial baking equipment intact, purchased the abandoned building in 2012. He chose the building because of the 50’ spans and lack of supporting columns, which makes it perfect for an adaptive reuse project. He is building a live/work spaces for artists, a community gallery, and a café. 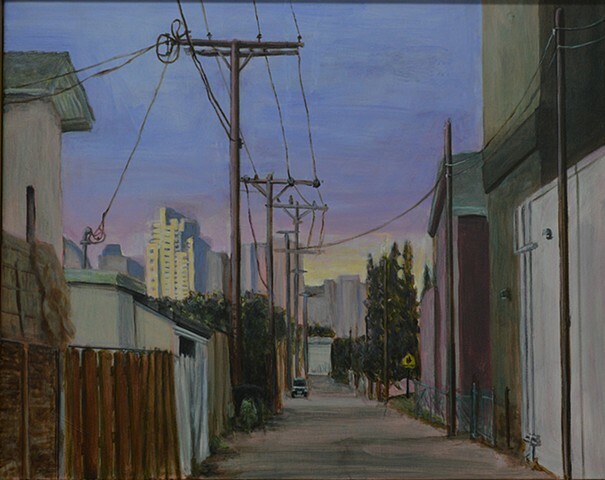 I like the view in this painting, of looking through the dilapidated alleyway, towards the shining city in the distance. I thought it was a good metaphor for the American Dream. About 6 months ago, an event was held to “clean up the alley” on this exact block!